This article employs a Pseudonym. Please do not replace that pseudonym with a real name without that person's permission. 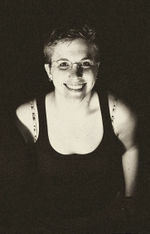 Cindy Page is a technical improviser, improv performer, musician, and Co-Technical Director of The Hideout Theatre. She was awarded Favorite Tech Performer at the The 2013 Institution Theater Awards. She was Technical Director for the Out of Bounds Comedy Festival from 2013-2017. A hideout blogpost by Ms. Page about improv tech. This page was last modified on 11 October 2017, at 21:43.